In recent airport news, Delta’s SkyTeam alliance opens a new lounge at Vancouver; American debuts another new Flagship Lounge; Kansas City voters approve a big airport construction project; Los Angeles’ Bradley Terminal gets automated TSA lanes; and Atlanta and Denver get popular new upgraded burger joints. 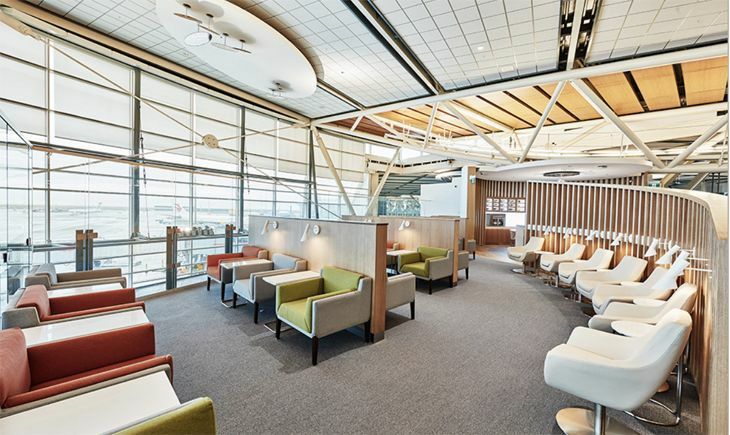 The SkyTeam global alliance –Delta, Air France-KLM and partners – has opened its first dedicated lounge in North America, at Vancouver International. The 5,600-square-foot facility is in the international terminal close to Gate 53 by the duty-free area. It offers a hot and cold buffet service with locally-sourced cuisine; a made-to-order noodle bar; showers; beverages including local wines and beers; and seating for 126 with a work area and a separate TV room. It’s the seventh SkyTeam lounge worldwide; others are at Dubai, London Heathrow, Hong Kong, Sydney, Istanbul and Beijing. It’s open to Elite Plus, first class and business class customers. 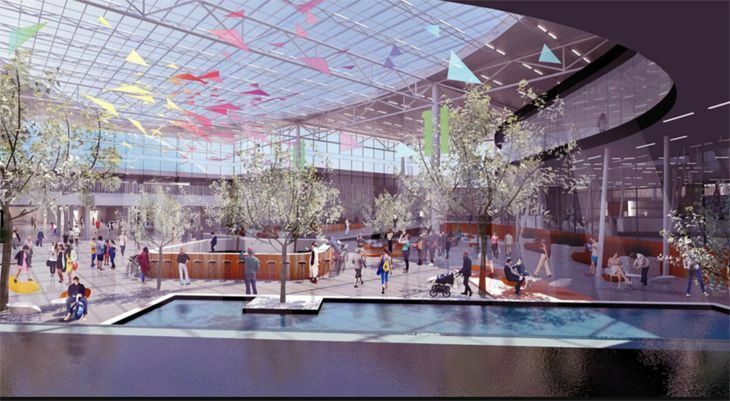 Kansas City International’s unusually designed three terminals will be replaced by a single large structure following a referendum this month in which voters approved the city’s plan to spend $1 billion on a major airport reconstruction project. The city’s plan calls for the existing 45-year-old, three-terminal structure to be replaced with an H-shaped building that has two passenger concourses and 35 aircraft gates. The new design will allow for an increased number of retail concessions, more bathrooms, and more efficient security screening, and will give the airport separate levels for arriving and departing passengers, along with close-in parking. No timetable was given for construction of the new terminal. Los Angeles International already had those new TSA automated screening lanes in Terminals 7, 2 and 4, and now it has opened five of them in the Tom Bradley International Terminal, with nine more coming there in the months ahead. The new lanes allow up to five persons to load their personal items into security bins simultaneously, and the belts automatically pull the bins into the x-ray device and return them back to the starting point. Items that need additional inspection are shunted off to a separate belt to keep the flow going, and bins are 25 percent larger than before. By the time all the new lanes are operating in the TBIT next spring, LAX officials said, the number of passengers that can be screened in an hour will increase by almost 1,000, to 3,220. But do those lanes really work? If you are wondering, don’t miss this post (and comments): Are automated security checkpoints better? As airports keep upgrading their food and beverage options, more of them are turning to burger joints that are a cut or two above the traditional fast-food franchises. The latest examples are Atlanta International and Denver International. At ATL, celebrity chef Bobby Flay has been tapped to bring a new Bobby’s Burger Palace to Concourse B, with its opening expected early in 2018. Flay already has 17 of the high-end burger restaurants around the U.S., but the ATL location will be his first in an airport. 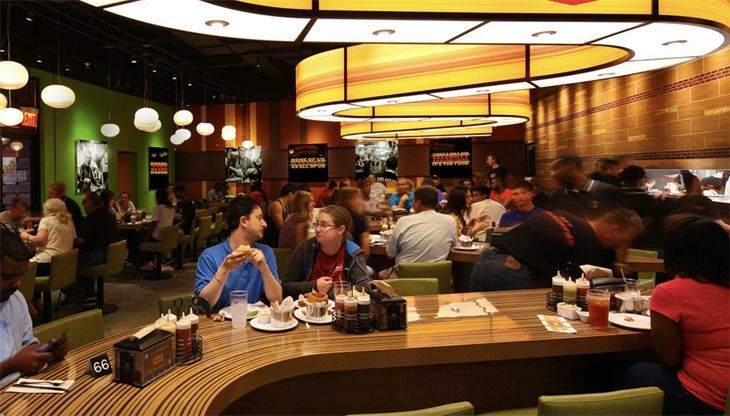 DEN, meanwhile, has turned to Denver-based Smashburger for two new locations. A 2,300-square-foot Smashburger just opened in the airport’s C Concourse, open daily until 10 p.m. It also serves breakfast, and will soon open a full bar with local craft beers. Next spring, a second and larger Smashburger will open in DEN’s B Concourse. In airport news, American Airlines opens a big new lounge at Chicago O’Hare; Los Angeles International travelers can now use an app to speed up re-entry after international trips; Pittsburgh International will get a massive makeover; Minneapolis-St. Paul gets faster TSA screening lanes; and facial-recognition boarding is a hit with JetBlue passengers at Boston. At Chicago O’Hare, American Airlines has cut the ribbon on its second new Flagship Lounge; the first was opened at New York JFK some months ago. 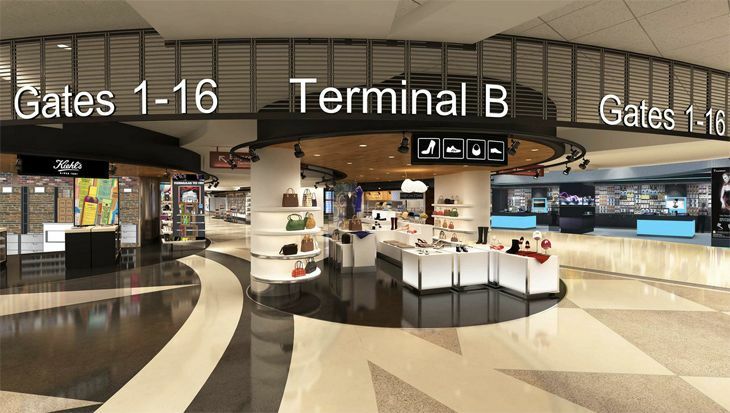 At ORD, the lounge is in Terminal 3, in the crosswalk between Gates H6 and K6. Hours are 5 a.m. to 10 p.m. daily. Targeted for AA’s international travelers at its primary gateway airports, the 17,000 square foot O’Hare Flagship Lounge is open to qualifying first and business class passengers, AAdvantage Executive Platinums, Platinums and Platinum Pros; AAdvantage ConciergeKey members; and Oneworld Emerald and Sapphire travelers. American said it expects to open additional Flagship Lounges before year’s end at Los Angeles International and Miami International, and in 2018 at Dallas/Ft. Worth, Philadelphia and London Heathrow. The O’Hare lounge can handle up to 300 passengers. It has showers, “quiet rooms,” a self-service wine bar, create-your-own cocktail service, hot and cold buffets and a chef to prepare customized offerings. U.S. Customs and Border Protection’s Mobile Passport Control app is now available for travelers going through Customs at Los Angeles International’s Tom Bradley International Terminal as well as Terminals 2, 4 and 7, airport officials announced. Available free at the Apple App Store and Google Play Store, the app lets passengers create a profile and submit passport information and answers to CBP inspection questions via their smartphone or tablet. 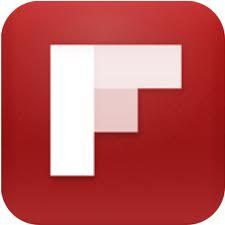 The app will then send users a receipt and an encrypted bar code to show to CBP agents at the airport. LAX is a little slow in rolling out the CBP Mobile Passport Control app – 22 other airports have already done so. Pennsylvania’s Allegheny County Airport Authority has unveiled a major redevelopment plan that calls for construction of a new landside building for Pittsburgh International’s Midfield Terminal and scaling back the terminal’s number of gates from 75 to 51. Besides new security, ticketing and baggage facilities in the $784 million landside building – which would be between the airside C and D concourses – the project also includes an overhauled international arrivals area, 3,000-space parking garage and other improvements. The X-shaped Midfield Terminal was built 25 years ago to serve as a hub facility for US Airways, but since the carrier downsized that operation and then was merged into American, the terminal now handles less than half the traffic that it once did. The terminal was built to accommodate up to 32 million passengers a year, but it currently handles only 8.3 million; the new facility’s capacity would be 18 million. The $1.1 billion plan calls for razing the existing landside building and the people-mover that carriers travelers from that building to the airside concourses. Construction is planned for 2019 to 2023. Minneapolis-St. Paul is the latest airport to install those new automated security lanes that are said to speed up the TSA screening process by as much as 30 percent. (Although we’ve heard from many frequent travelers who would disagree with that assessment.) MSP now has four of the new lanes at the Terminal 1 south checkpoint, and will expand them to the north checkpoint next year. The lanes allow several travelers to load their belongings into bins simultaneously; the bins are larger than before, and if a bag raises the concerns of the TSA agent manning the x-ray machine, it can be shuttled off on a separate conveyor belt for further examination without slowing down everyone else. Empty bins are sent back to the starting point by a separate conveyor belt, freeing up TSA agents for inspection duties. 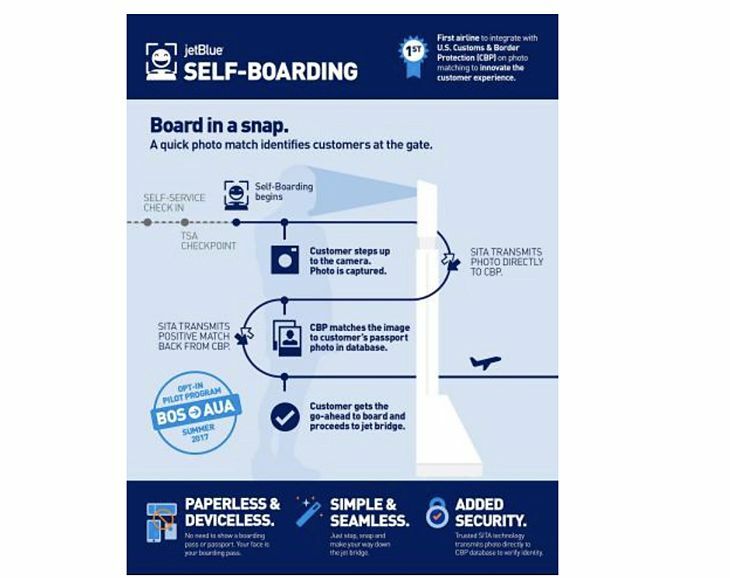 Some months ago, we reported on JetBlue starting to test facial recognition technology for passenger boarding at its Boston Logan hub. Instead of having to show a boarding pass, passport or anything else to the gate agent, passengers simply stand in front of a camera and proceed on board. After four months, SITA — the technology company that provided the new system — said its biometric scanning proved to be quite accurate in the tests, with a success rate of almost 100 percent matching passengers’ facial images to those in government databases to verify identity. The company said a majority of JetBlue passengers on the airline’s Boston to Aruba flights used the camera option to board. American Airlines has cut the ribbon on its first new Flagship Lounge at New York JFK; faster TSA lanes have opened at JFK’s Terminals 2 and 4; Chicago Midway gets a bunch of new food and beverage outlets and stores; Philadelphia International moves ahead with a big improvements project; more details on the new hotel coming to Minneapolis-St. Paul; and Charlotte unveils a long-term development program including an on-site hotel. American has opened the first of several new premium airport lounges at its New York JFK Terminal 8. The newly renovated and enlarged Flagship Lounge is now available not just to first class flyers but also to business class passengers on international and transcontinental flights. (But first class travelers do have exclusive access to the new sit-down dining experience at the lounge’s new Flagship First Dining facility.) 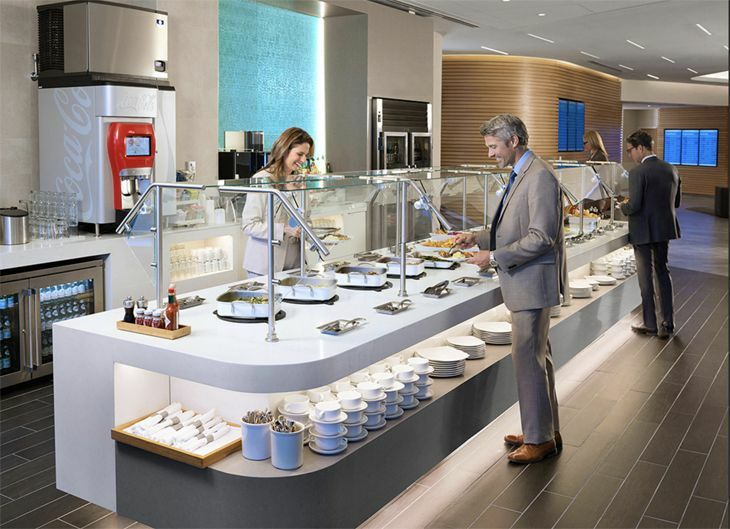 The Flagship Lounge offers quiet rooms, individual work pods, showers, a hot and cold food buffet, and made-to-order dining entrees. There’s also a “make your own cocktail” station. 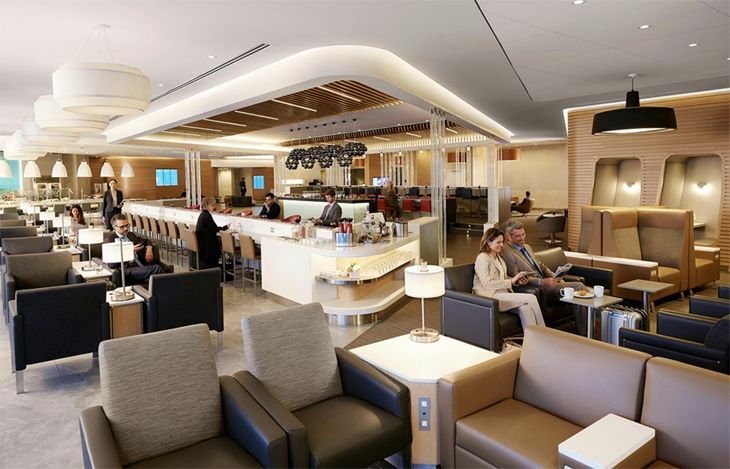 Later this year, American will open renovated Flagship Lounges at Los Angeles, Chicago O’Hare and Miami; and in 2018 at Dallas/Ft. Worth, Philadelphia and London Heathrow. Elsewhere at JFK, Delta’s Terminals 2 and 4 are now equipped with those new “smart lanes” at TSA security checkpoints. Offering automated conveyor belts, larger bins, and the ability for more travelers to load up bins for the x-rays simultaneously, the new lanes are estimated to speed up the lines by 30 percent. Three new restaurants have opened in Terminal B at Philadelphia International, with more improvements on the way. 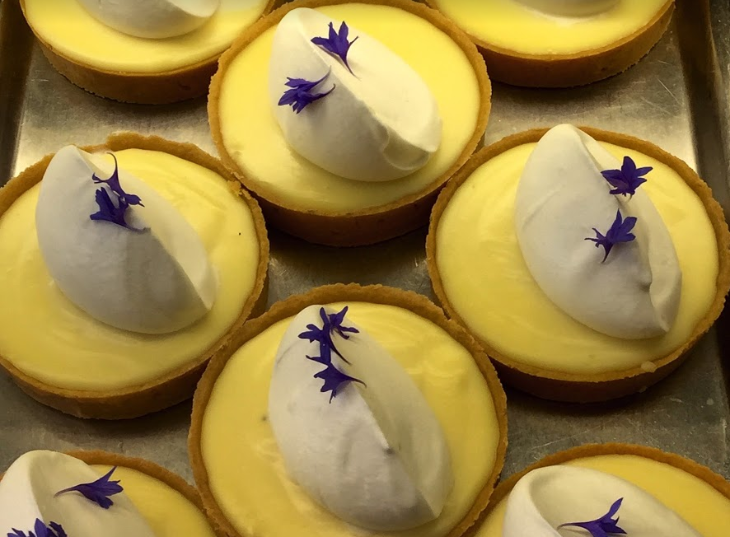 They include an Italian restaurant, a French pastry café and a German beer garden, and all feature iPads for ordering – a trend that is spreading quickly at major airport food outlets. (Passengers seem to love or hate iPads in equal measure.) They are among a total of eight new restaurants coming to the facility, all iPad-equipped, as part of a $33 million terminal redesign. 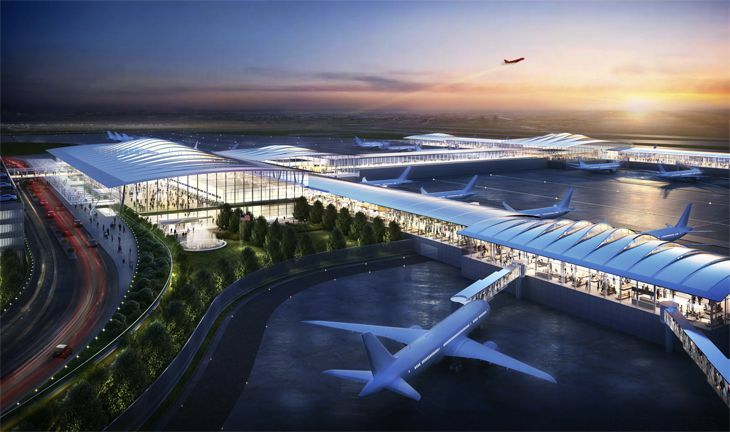 That’s just a piece of a larger $900 million airport improvement project at PHL that will include substantial enhancements to basic infrastructure like elevators and escalators, along with plans by American to build a new front entrance to replace the Terminal B and C ticketing areas. Chicago’s Midway Airport is bringing on 21 new food and beverage outlets and retail stores, the airport announced this month – all part of an ongoing $75 million improvements program. The project will increase the number of full-service sit-down restaurants at MDW from one to three, and will add other dining options ranging from a sushi outlet to a burriteria to a Dunkin Donuts. 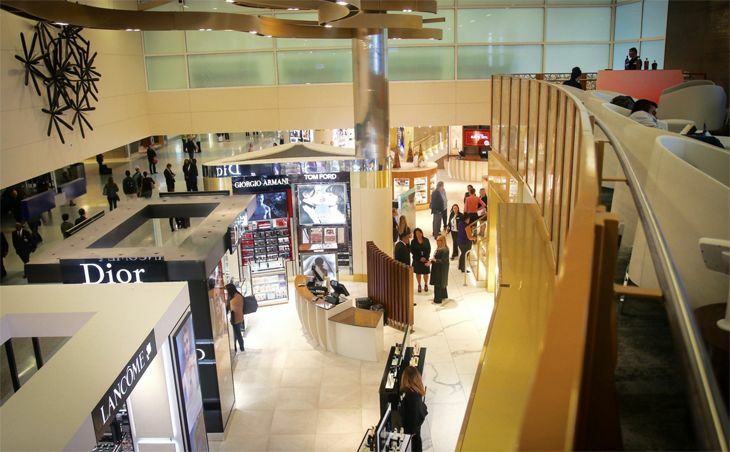 New retail stores at the airport include Tech on the Go and Sweet Indulgences. Other outlets will feature well-known Chicago brands like the Home Run Inn and Go Go White Sox. An airport hotel with its own TSA security checkpoint? That’s one of the innovations coming for the hotel under construction at Minneapolis-St. Paul International, due to open in the summer of 2018. InterContinental Hotels Group said this month that its new InterContinental Minneapolis-St. Paul Airport will be linked to Concourse C of the airport’s Lindbergh Terminal via a climate-controlled skybridge. The 12-story, 291-room hotel will also offer two restaurants, an upper-floor “observation bar,” an InterContinental Club Lounge, business and fitness centers, and a spa. Companies will be able to schedule same-day, fly-in, fly-out meetings, since the hotel will have 20,000 square feet of meeting space, including a 10,800-square foot ballroom. New on-site airport hotels are also coming at San Francisco, Atlanta and New York JFK, and now one has been announced for Charlotte Douglas International in North Carolina. 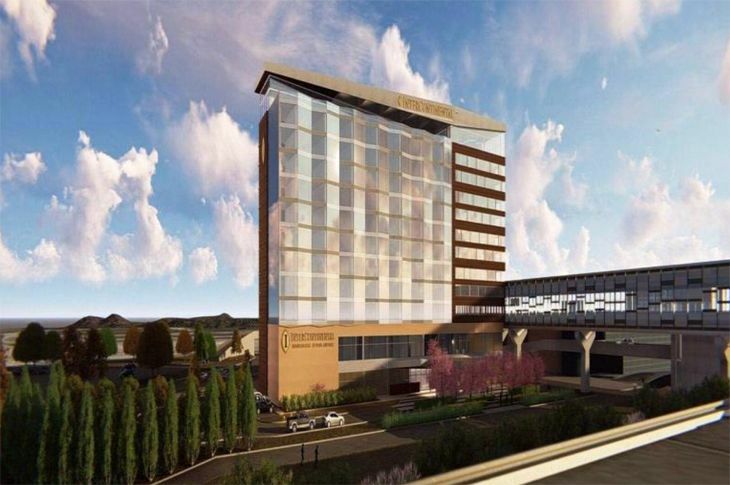 Airport officials said this week they plan to build a full-service hotel on the site of the airport’s existing control tower, which the FAA will replace with a new structure in 2020. The tower is just north of CLT’s new hourly parking deck adjacent to the terminal. In a presentation to the Charlotte city council, airport officials said their new long-term development plan also calls for construction of an automated people-mover that would run from the hourly parking deck through the hotel to Wilkinson Boulevard, where to would link up with a new light rail line planned by the Charlotte Area Transit System.